Volcom Stone continues to surge ahead with its original Wild In The Parks skateboard series. In its 8th European season, Volcom Stone's WITP will stop in 20 locations this spring and summer from Portugal to Russia. 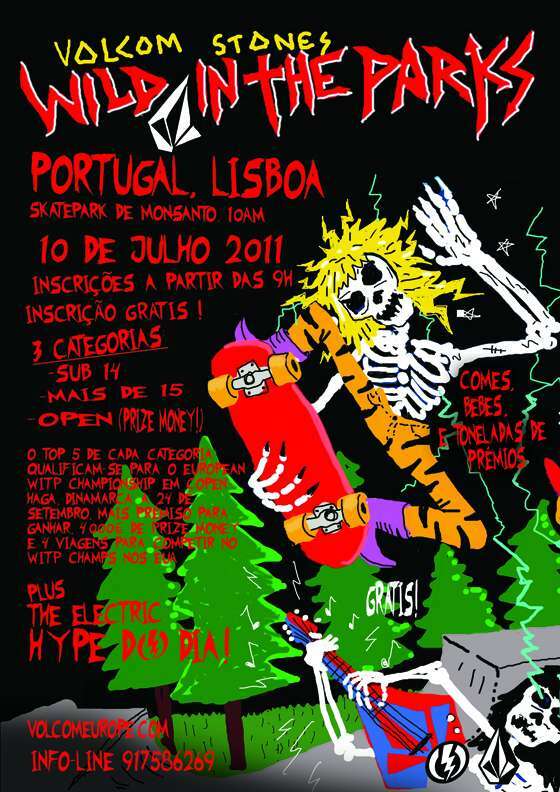 The POTUGAL stop will be at Skatepark de Monsanto (Lisboa) on Sunday 10th July. With cash prizes for the Pro/Am division in addition to the 14 and under and the 15 and over categories, Wild in the Parks is a showcase for all talents and ages. And as every season, these contests are entirely free! Top 3 of each category will qualify to the European WITP Championships on the 24th of September in Copenhagen, Denmark with more prizes and cash to win as well as trips to the world WITP champs in the USA ($25,000 prize money).